We might have felt that way too, if we’d stopped to think much about it at all. 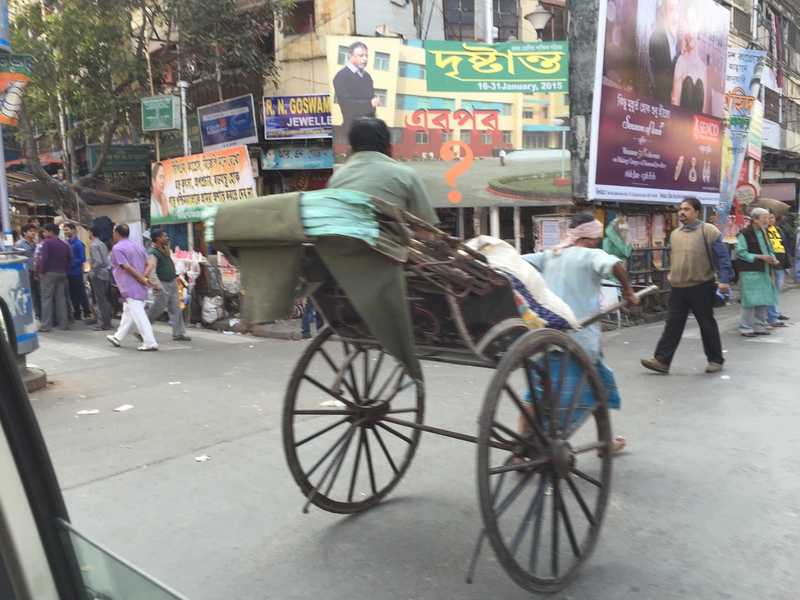 Kolkata is certainly Indian: messy, noisy, complicated. And it is fun, very safe, vibrant, exciting. It is a walking city, a never-sleeps city, a shopping city, a colorful city. Saturday was our first day more or less on our own, and we had a great time of it. 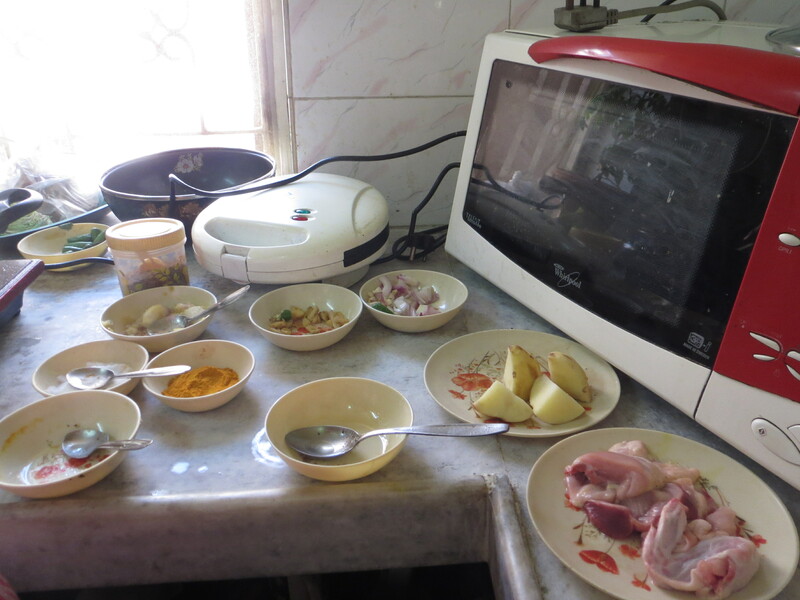 Our first event was arranged through our travel agent, SITA, a cooking class in a middle class home. Our hosts live in a ‘housing estate’ which is a block of apartments, individually owned, about 5 stories high. 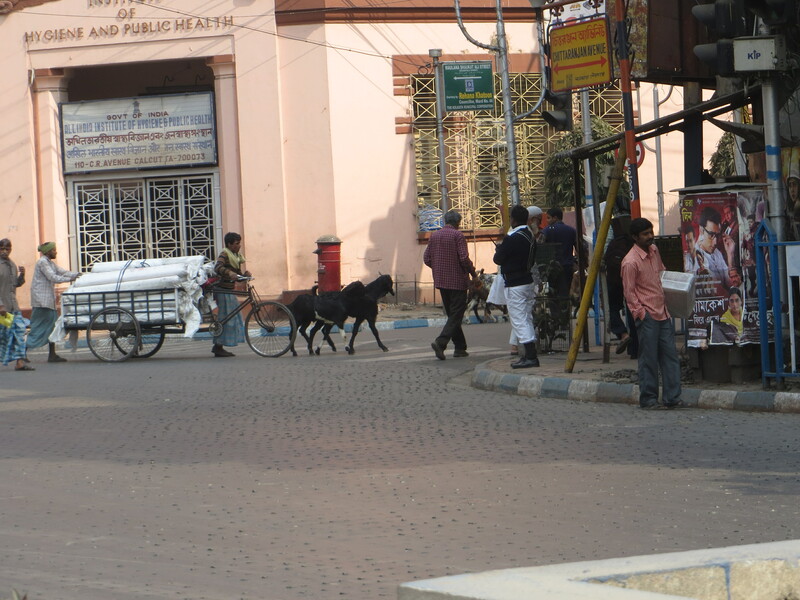 Very middle class, albeit with men walking around selling cooking pots and pans from large baskets on their heads, rickshaws and within a block or two a few cows lying on the sidewalks. Our hosts are both educated and work as guides themselves. When we arrived, Mr. Napan (I have to check this–we weren’t taking notes!) asked where we were from, and when I said California he immediately asked “Habla espanol?” Turns out this is his primary “guide” language, in addition to of course Hindi, English and Bangla. 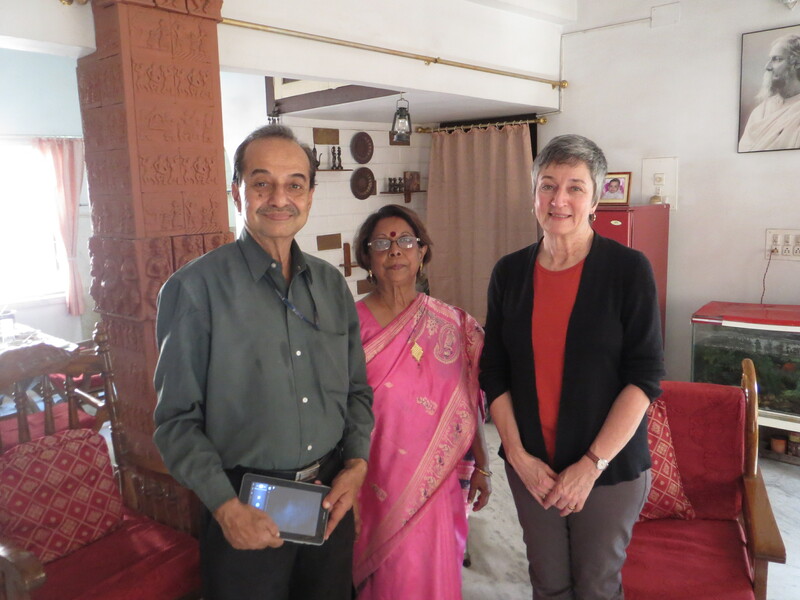 We had a lovely visit, served fresh orange juice to start, and then went into the kitchen to watch lunch being prepared. It was delicious, and, of course, way too much food. 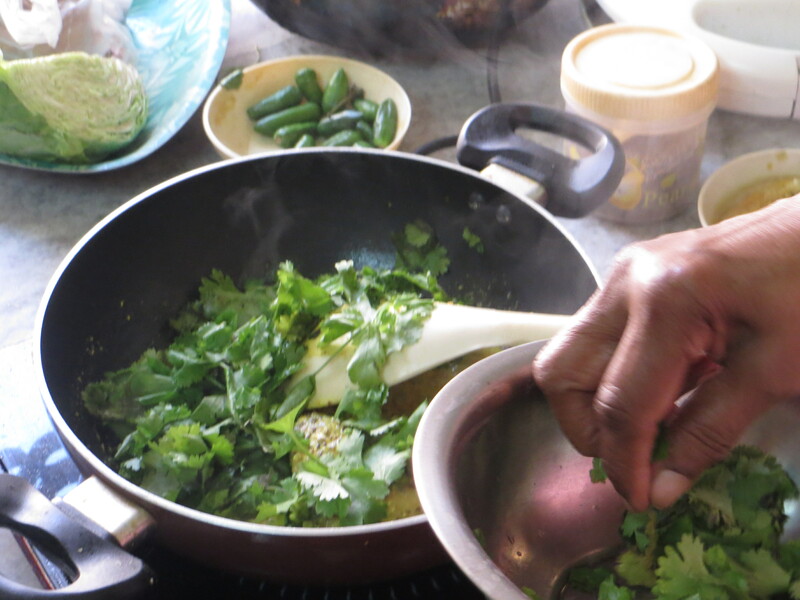 A chicken and potato dish, made with a paste of ginger, onion, and garlic; cauliflower prepared with salt, sugar (to help it brown), and cumin seed, as well as carmelized onion, garlic, and ginger; a simple yellow lentil dal, fish cooked in mustard with cilantro, and rice. And of course homemade paneer sweets (sweetened with the juice of something we asked several times to repeat but never got it). Stuffed. She cooks in a tiny kitchen, moving between an electric hot plate for frying and browning, a 3 burner gas “stove” that sits on the counter, and a microwave. 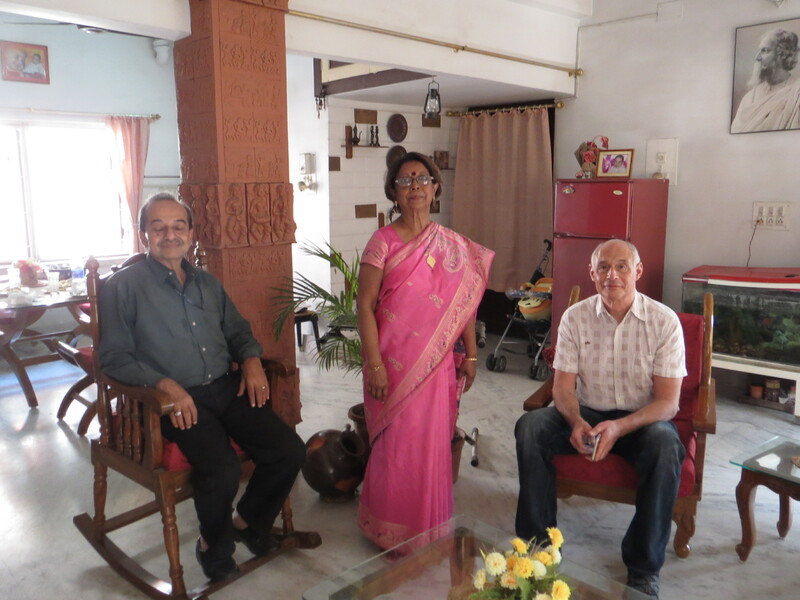 After lunch we visited for an hour, talking India and Indian history, family, travel. They want to come to the US (having traveled in Europe only) to see Miami Beach, Niagara Falls, and the Grand Canyon. The drive to and from their home was as interesting as the visit. 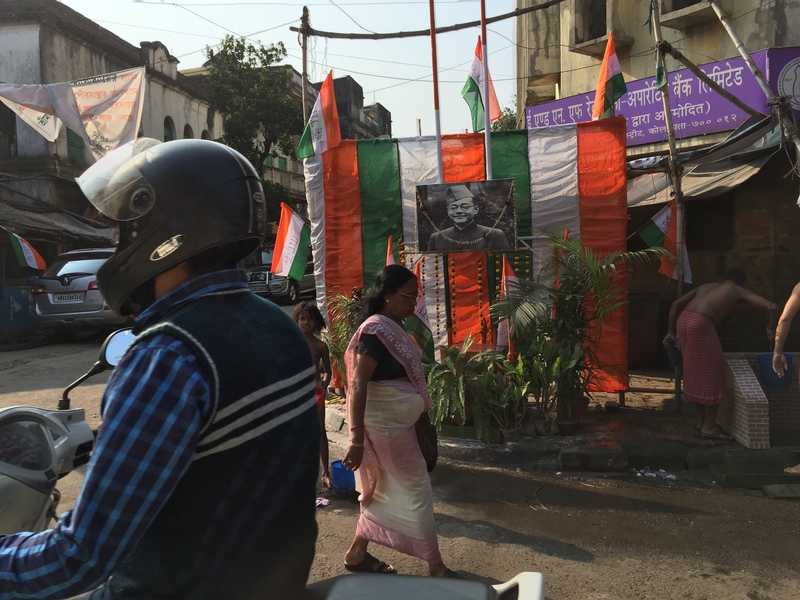 It was a festival day and every few blocks there was a temporary shrine set up on the street, large and small, elaborate and simple. One was decorated with colorful rosettes, which when we got close turned out to be made of concentric paper plates and cups, with plastic utensils arranged around in a corona. Very creative. Others were draped with sparkling garlands, marigolds (of course) and banners, some even with candles. 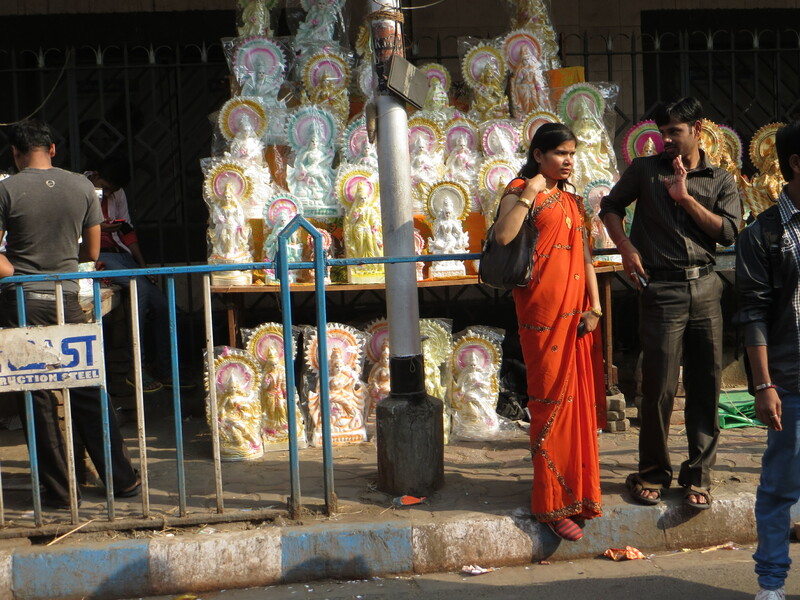 Many young women strolled in their festival saris. 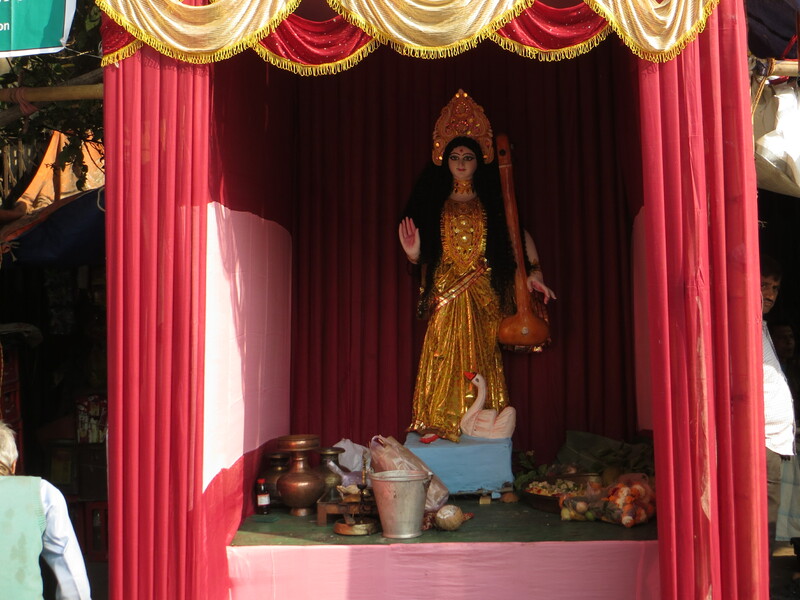 One of maybe 20 pop up shrines we saw on the way back from the cooking class/home visit. Some bigger, some smaller. 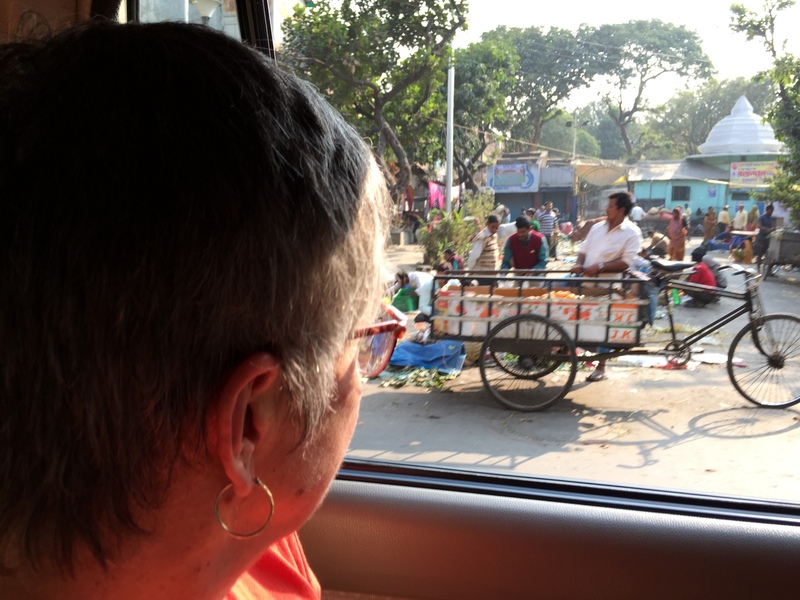 Kolkata is the only large (14 million people) where there remain many walking/running rickshaws in addition to the ubiquitous bicycle versions. Of course it is hard to imagine making a living this way, and I was surprised to see both young and older men doing this work. 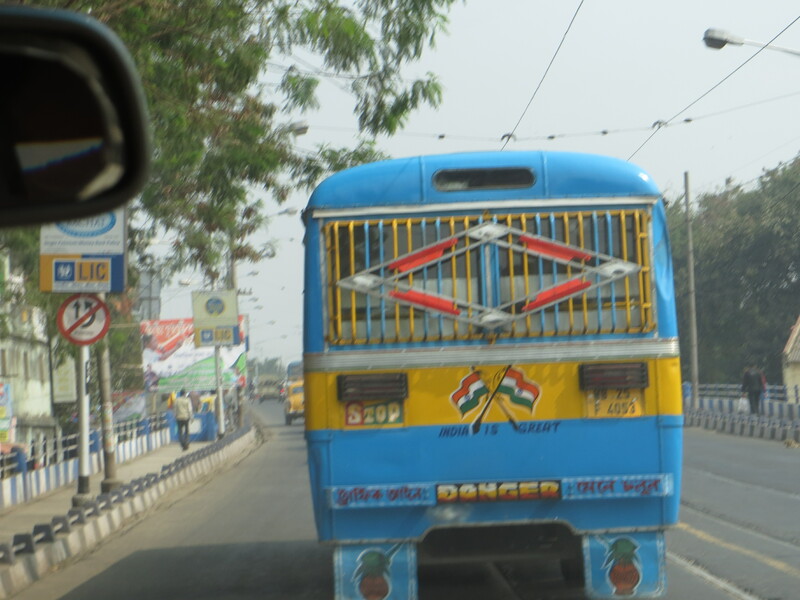 I love the sign on the back: India is Great. 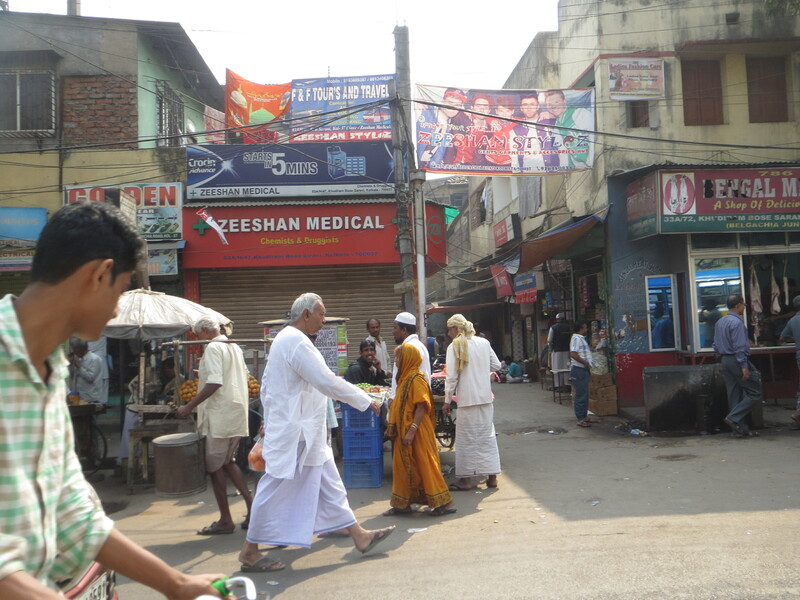 Every city we have visited has a large Muslim population. 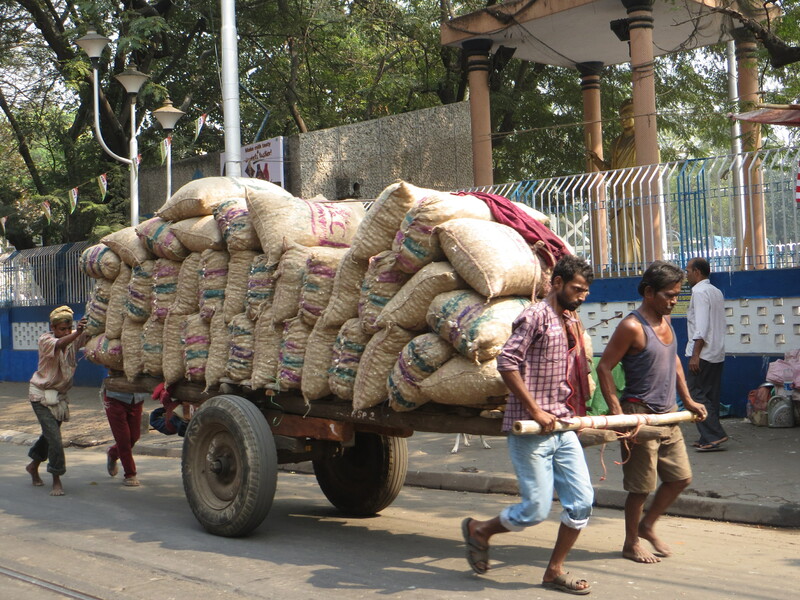 There are so many carts drawn by men on foot–the largest with a few in the front pulling and a few in the back pushing. 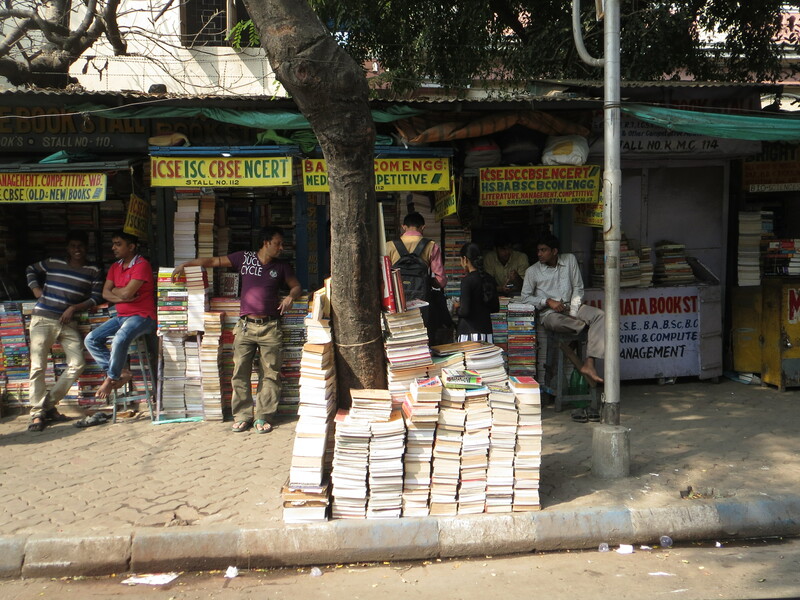 One tiny sample of the bookshops–there are blocks of them. 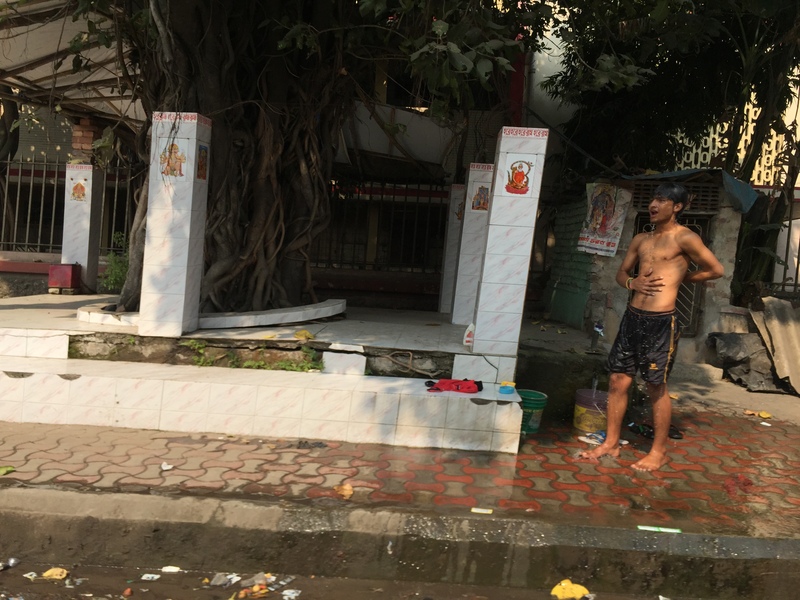 Bathing on the street is quite common. 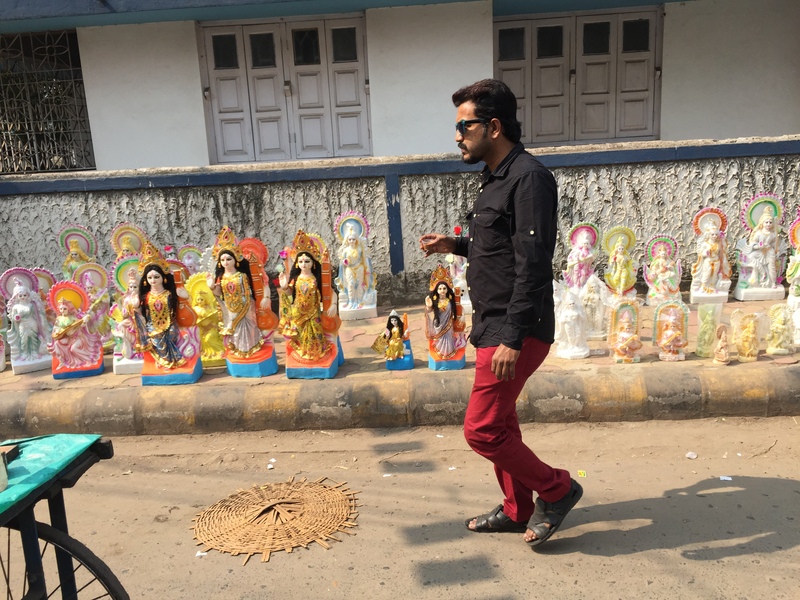 These figures are for home shrines, made of clay that supposedly dissolves when they are taken to the Ganges to float away at the conclusion of the festival. The shopping scene is amazing. 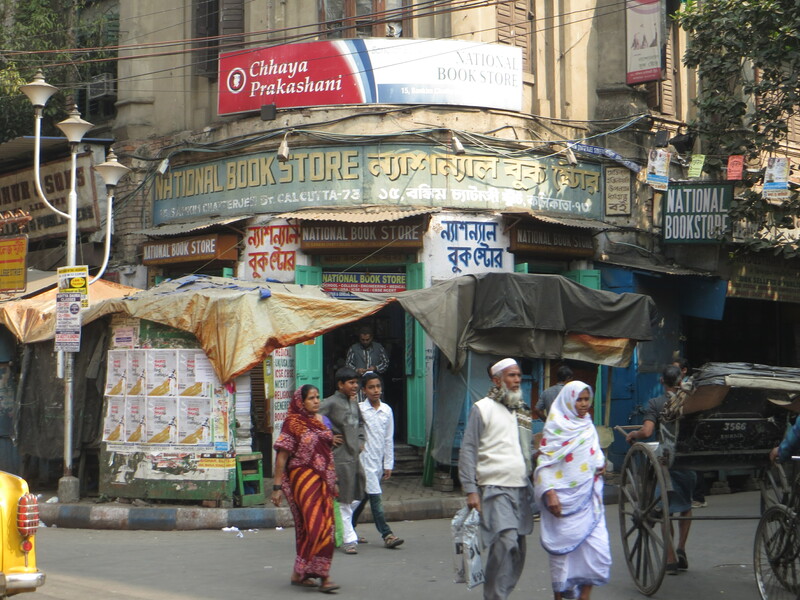 We drove through the bookseller neighborhood, with blocks and blocks of book kiosks as well as book stores. We drove through what seemed to be the plywood district, where almost every store sold “Ply.” The area around the hospital is filled with stores announcing “Scientific” as well as chemists and medical supplies. On the way home we asked to be let out at the New Market, which was built in the 1800’s and is, like a typical inside market in Latin America, a maze of stores selling food, housewares, clothing, trinkets, candy, jewelry, spices, crafts, and filled with men who try to lure you to their stores. 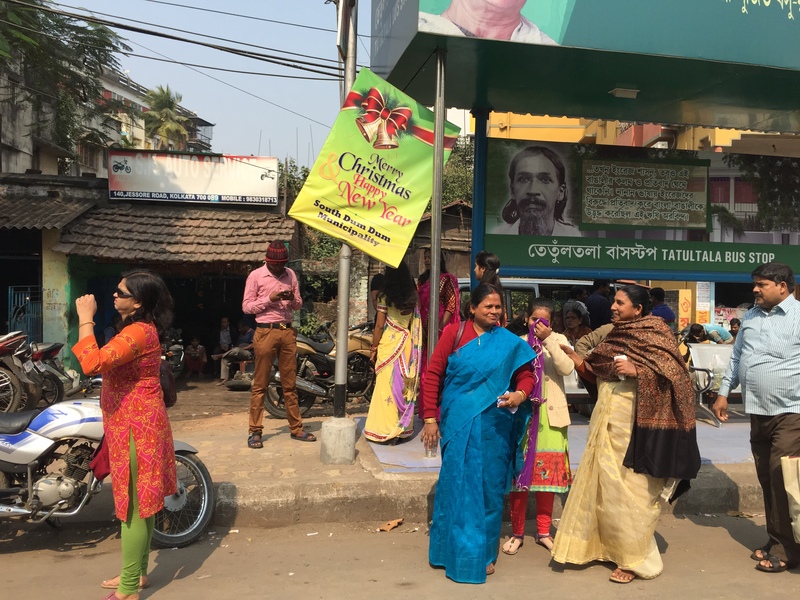 We went along with a few of them, and in one case were happily surprised that in addition to clothing–men’s shirts and women’s tunics–this tiny shop had a small corner shelf of spices in big jars. They smelled incredibly fresh, and we bought garam masala and chicken masala, very cheap, in glassine envelopes which they sealed by running the folded edge slowly through a candle flame. 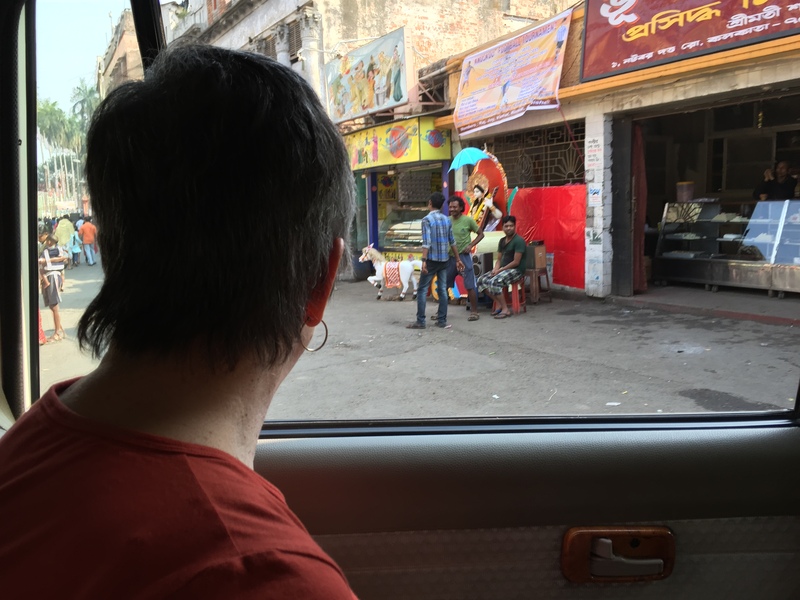 We also spotted, as soon as we entered, a store selling packaged snacks (chips and things) as well as various spices, where we picked up some saffron. 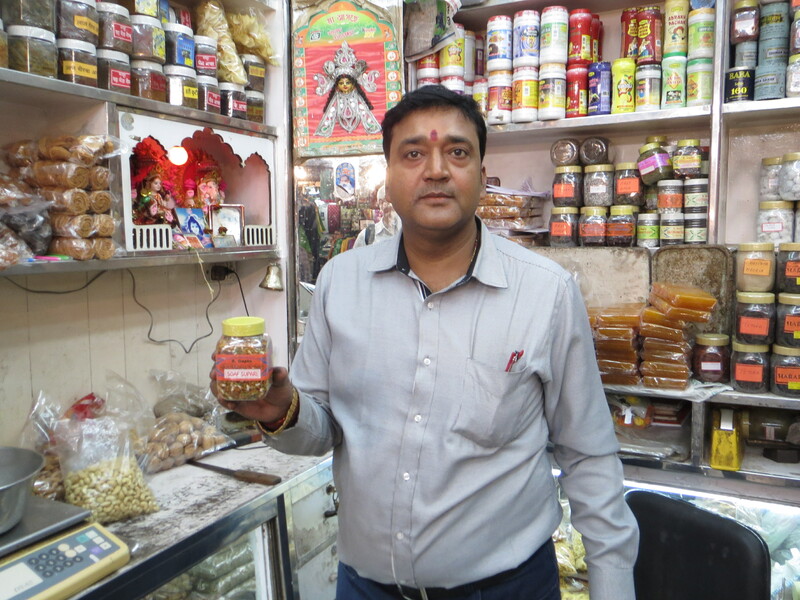 But what attracted me to the store were several shelves of various types of the little breath-freshener anise seed mixtures you see in a dish at the register of an Indian restaurant both here and in the US. I had hoped to find something similar to the delicious mix we had at Pindi in Delhi, and I did. Our purchase of “breath freshener” mix. We wandered back to the hotel, buying a little thing or two on the street, and ended up sticky and tired. For dinner we were pretty sure we needed a non-Indian food and discovered a very well reviewed Italian restaurant was only a few blocks from our hotel, so we headed over. A bottle of Malbec later, as well as a pizza (more like naan with pizza toppings, but delicious), salad, antipasti, and we went wandering in the neighborhood again. 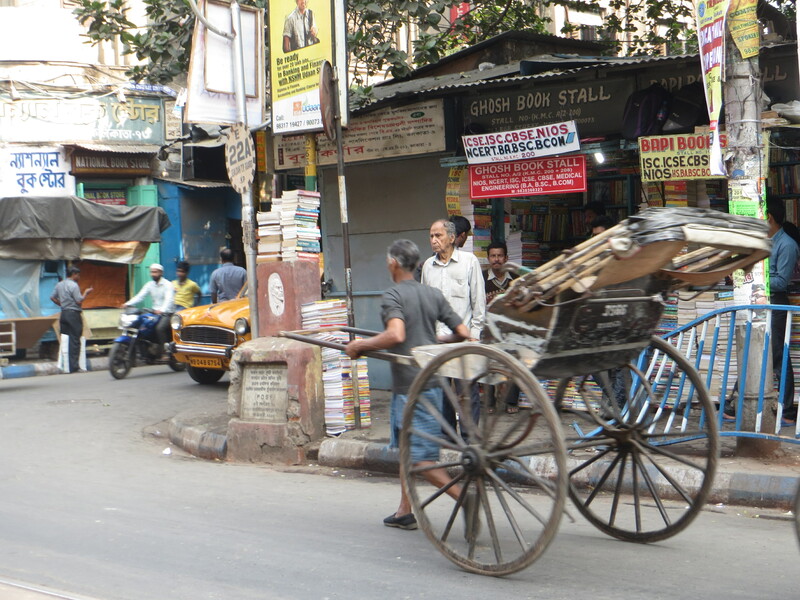 Saturday night is a hopping time, and the streets were full of shoppers, people eating street snacks, children, teenagers, construction, road repairs–the hub-bub we’ve come to expect in Kolkata. We stopped at a music store, where the four young men working there seemed a bit standoffish and bored. That is, until we started a conversation about what we should buy as good Indian pop, and could we listen to a few things. All of a sudden the conversation was animated, friendly, and a lot of fun as one CD after another was opened, explained, sampled (and purchased–very inexpensively). “This guy was #2 on Indian Idol but now he is a star and no one remembers #1!” “This Pakistani fellow is wonderful–listen to this!” Singing along, explaining the lyrics–we had a lovely time. Walking back we again passed the ironing stand, where for 5 rupees he will iron your shirt with, of course, an old-fashioned non-electric iron. 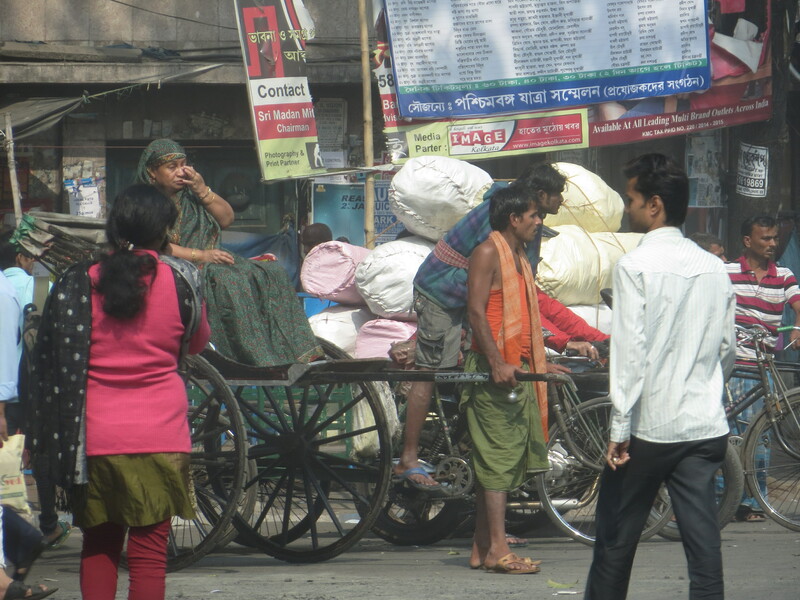 I wasn’t comfortable taking his picture…but the smell of clean ironed cotton was so nice. Such beautiful pictures and descriptions. It’s almost like being there with you. I am impressed with your stamina. What an amazing vacation.